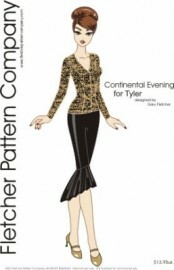 "Continental Evening " for Tyler is designed by Gary Fletcher. Pattern includes a long sleeve fitted jacket and sleek skirt with ruffle. The PDF version prints on A4 and 8 1/2 x 14 legal size paper.